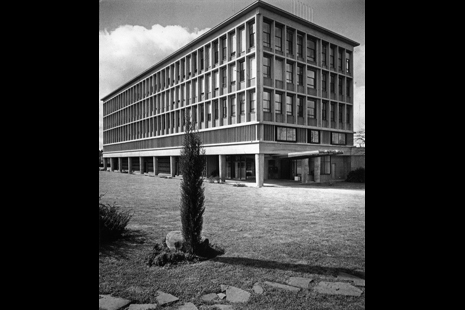 The first building by Jean Tschumi (1904-1962) in Orleans, France has been saved by a coordinated international preservation effort. Designed and built between 1947 and 1953, the pharmaceutical center had been slated for demolition but was preserved by a three year-long effort led by local residents and Bernard Tschumi with the support of major French and international architects and historians, including Herzog and De Meuron, Rem Koolhaas, Zaha Hadid, Jean Nouvel, Claude Parent, Christain de Portzamparc, Odile Decq, Rudy Ricciotti, Barry Bergdoll, and Kenneth Frampton, among others. With its impressive concrete structure, Jean Tschumi’s building is being restored and repurposed as an “incubator center” for digital technologies, demonstrating the adaptive re-use of significant 20th-century structures.